"A Royal Crown Offered in Pawn"
From the New York World -- Dom Carlos, King of Portugal , has succeeded as a royal attraction in London to King Khama of South Africa  and Nasr Ullah Khan of Afghanistan . Dom Carlos has brought his crown with him, and this fact alone is sufficient to make his visit of peculiar interest. It is officially announced that he wishes to consult London jewelers concerning repairs to be made to the crown, but the truth is that he is desirous of realizing a considerable sum of ready money on the bauble. His salary has not been paid for two years, and there is distress in the royal palace at Lisbon, appropriately called the Necessidades . The crown of Portugal  is the most valuable in Europe, although little has been heard about it. It is valued at $8,000,000. 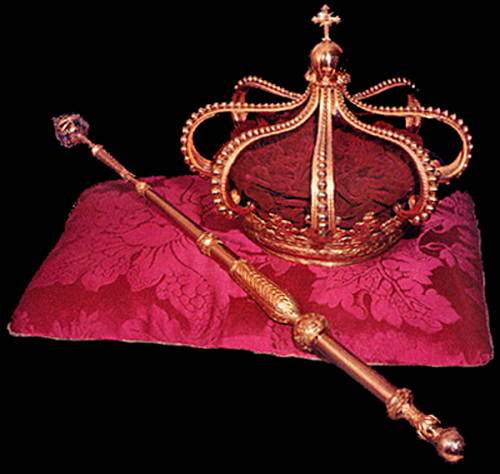 After it comes the crown of Russia, valued at $2,500,000, and next that of Great Britain, valued at $2,000,000 . It is not unusual nowadays for kings to travel about with their crowns. Probably Dom Carlos thinks he can get a better price in London than elsewhere. He is not familiar with the United States of America. The jewels in the crown consist of diamonds, rubies, pearls, sapphires, and emeralds, set in solid gold. Its weight is three pounds five ounces troy. The foundation of the crown -- that is, the part which rests upon the head -- is a solid heavy band of gold, completely covered with precious stones. Many of them are historical relics of Portugal's former greatness. They were brought to enrich the crown of Portugal when the mines of the Indies and Brazil were at the disposition of that valiant little country . Conspicuous among the jewels decorating the band are four enormous diamonds, cut in regular diamond shape, and four rubies. From the band rise four heraldic oak leaves. Each of these is also studded with precious stones. From the eight leaves issue four arches which come together in a point above the crown. The arches are decorated with the conventional gold balls usually seen in crowns, but the interstices are filled with diamonds. Above the point of the arches is a jeweled ball, or orb, and this is finally surmounted by a Maltese cross. Such a crown is altogether too expensive for a poor little country like Portugal. The King would be morally justified in selling it if he intended to make a proper use of the money. It is not hinted, however, that he intends to sell the crown. He will merely pledge it . 1. 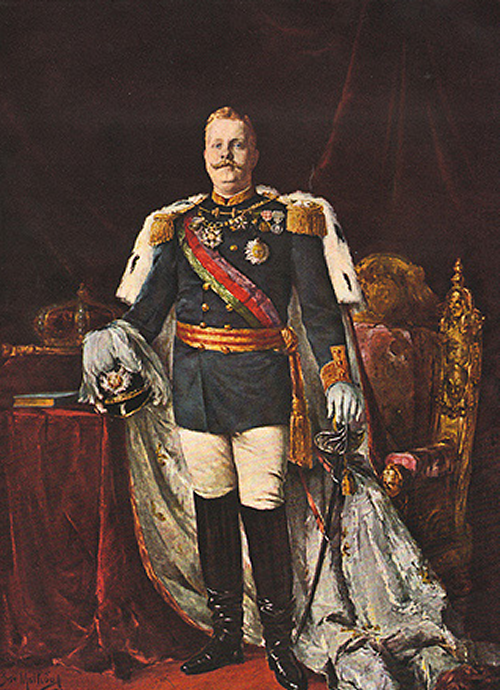 King Carlos I of Portugal (1863-1908), the son of King Luis and Queen Maria Pia, reigned as Portugal's monarch from 1889 until his murder in Lisbon in 1908. 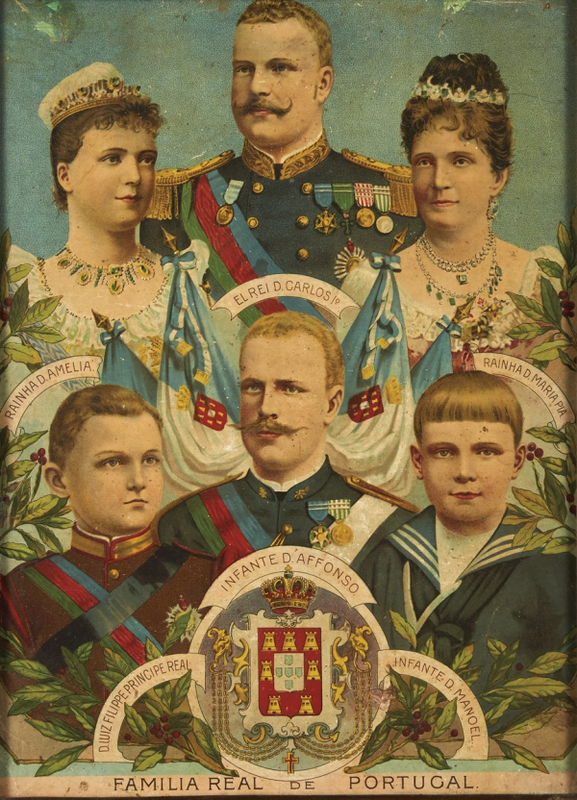 He made a state visit to the United Kingdom in 1895. His reign was marked by economic turmoil, including two national bankruptcies. He was assassinated in a Lisbon square while riding in an open carriage in February 1908. 2. Khama III (1830s-1927) was the leader of the Bamangwato, who live in present-day Botswana. At the time this article was published, he had just visited Queen Victoria in London to ask her to protect his land from further annexation from Cecil Rhodes and the British South African Company. 3. Nasrullah Khan (1874-1920) was Afghanistan's crown prince in 1895; he eventually reigned as the country's emir for one week in 1919. At the time this article was written, he had recently made a state visit to the United Kingdom on behalf of his father, Emir Abdur Rahman Khan. 4. The Necessidades Palace in Lisbon was the residence of Portuguese monarchs during the nineteenth century. Its unusual name comes from its original use: it was a convent that included a devotional chapel for "Our Lady of Needs." Today, the building houses the Portuguese Foreign Ministry. 5. The Crown of João VI, made in 1817 by Antonio Gomes da Silva for the acclamation ceremony for King Joao VI (1767-1826). Portuguese monarchs did not wear their crowns, though they were present in the room during major ceremonial occasions. This crown, along with the rest of Portugal's crown jewels, is kept in the Ajuda National Palace in Lisbon. They are not regularly displayed in public, in part because of a 2002 theft while some of the jewels were on display in the Netherlands. 6. There's no accepted estimate for the value of crowns like the ones mentioned here; regardless, when considering the stated estimate for Britain's crown, it's worth remembering that the Cullinan II was not placed in Britain's Imperial State Crown until the 20th century. 7. Portugal had a colony in India from 1505 until 1961 (or 1975, depending on whom you ask). Portugal's colonial and imperial history in Brazil lasted from about 1500 until 1889. 8. Various stories similar to this one seem to have circulated during Carlos's reign, including one version that claims he pawned the crown jewels while visiting Britain to attend Queen Victoria's funeral. I haven't seen any conclusive evidence that the jewels were ever pawned during Carlos's time on the throne.